On Sunday, March 13th, the Museum Of The Moving Image will be presenting “A Day With Oliver Stone,” consisting of screenings of the director’s films Nixon and Alexander, and a Q&A between Stone and critic Matthew Zoller Seitz. In conjunction with the event, Stone spoke with The A.V. Club about an up-and-down career that’s seen him vilified as much as he’s been hailed, and about why he continued to tinker with Alexander after its original release in 2004. The A.V. Club: You’ve revisited Alexander a couple of times, first to shorten it, then to lengthen it. Out of all of your films, what’s driven you to keep returning to that one? 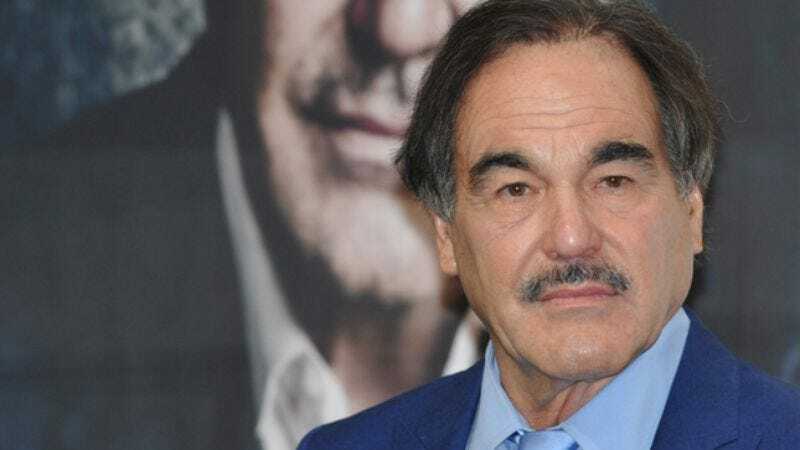 Oliver Stone: I was unhappy with what I’d done. This was a massive man—what he did, who he was—and the most ambitious project I’ve ever undertaken in terms of its importance. I didn’t tread lightly. I didn’t go back to it for money, but because it was bugging me. [Laughs.] I’d re-done the DVD because we had financed the film on the promise that we’d deliver “Son of Troy,” the idea being a follow-up to Achilles’ death. Or “Son Of Achilles.” We were locked into a release, I believe, in fall of 2006, and we were shooting in early 2006, so it was very difficult to make that date, but I got it out as a two-hour-plus something, and it just didn’t satisfy me. It just didn’t tell the story. So I went back and did a DVD which was actually shorter, and which I thought dealt with the tremendous structural complexity of the film better. But it still didn’t solve the problem for me. Then two and a half years later, I went back with the corporation of the Warner DVD people—not the film people—and I worked very hard for almost a year off-and-on on this new version, this restored version, which is three hours and 48 minutes. This is the way the script was written originally, with The Battle Of Gaugamela first, and an intermission. I really wanted to do an intermission like Bertolucci had done in 1900, or like the road-show films I had seen as a young man. This is the best I could do with what I had shot. This is all the footage I have. There’s no going back anymore; this is it. And frankly, this is the one I’d like to live and die by. It’s more complex. I think you understand the characters better. But no one’s really watched it, because it was never promoted. Warner’s very happy with it. It did well for them, actually. As a catalog item, the DVD sold close to a million, which is astounding. I’ve been told it’s the highest-selling catalog item they had, and that even though they don’t advertise, people keep ordering it. And this is a chance here, with the Museum Of The Moving Image, to bring it to perhaps a few cinephiles’ attention. It really has been hard to get something like this going again after so many years, but it matters. It matters as a movie. AVC: You’re no stranger to making films on a large scale. How do you maintain control on a project that sprawls like that? OS: This was independently made with Moritz Borman and Intermedia, so we had control from the beginning. We never financed it out of one studio. Warner Bros. took control, in a sense, because they had the U.S. release and they kind of insisted on some notes, but I ignored their notes for the most part, and got in a lot of trouble. Notes about cutting the homosexuality and cutting the violence—which was quite a bit, but nothing compared to the new one. So this is a version that’s completely free of any constraints, completely free. You know, what I should’ve done at the time is what Sergio Leone did with his Once Upon A Time In America. I would’ve released a full-blooded version in Europe at Cannes or something, and released some bowdlerized version in the United States earlier, which would have been panned and had no trace of sexuality or violence in it. It would have been an ugly version, but I think the European version would’ve predominated over time. But I would’ve been in deep trouble with the system. I was trying to make everyone happy and I was dealing with different countries. When I say it was an independent film, you realize it was financed by separate countries, so I was trying to make a lot of people happy. AVC: What about in terms of just managing the set, keeping everything straight in your head? OS: Oh, that was fun. It was huge. At this point, I’d had quite a bit of experience, so I was comfortable with it. But it was huge. We had armies! We had real elephants, real horses. And horses are very difficult to shoot. We had armies of horses in Morocco, and then we brought trained horses to Thailand, and we found that was very difficult because the elephants spooked them. There were a lot of potential accidents, and there were a few actual accidents, but nothing serious. Nobody got killed, but the horses in that forest with the elephants was pretty tough. And Colin [Farrell] broke his leg at one point, so we had to reshoot some stuff at the end, which was very difficult. He did it in severe pain. OS: No, I am a storyteller, and I do love ideas. But I’m also trying to understand my life. The one that I’ve experienced. Because we all know what we know. We experience with our minds and breath. What I’ve experienced, I’m trying to put in a narrative form, I suppose, to say that it does make sense in this way. I look at Homer and The Odyssey and all the disparate adventures this guy goes through, and then he returns home and the question is, is he the same man who left? I think our life is a series of adventures. There is a narrative to every life, and I believe in the classic mode of storytelling that goes back to Homer and carries through to today. The Greek playwrights, we’re all beholden to them, every one of us. Whether it’s The King’s Speech or even The Social Network. Now, we live in an age where we have so much information that we do tend to overload. The Greeks did too, though. Cynicism was a school in Greece—the Cynics. Diogenes is a famous Cynic. There was a strong belief in nihilism and narcissism. Those are old schools too. We could learn a lot from the ancients, and we should go back there, I think—and not just in Gladiator form. I love Gladiator, by the way, and I love Troy. They’re good, fun movies. But there’s also truth in what those stories actually were. AVC: You mention on the commentary track of the Alexander Blu-ray that the film was ridiculed, which is something you’ve dealt with a lot on your films, with critics slamming you and your work. Do you pay attention to criticism? OS: I do and I don’t. They hurt. I’m not thick-skinned in that way. I certainly pay attention, and it does hurt if I allow it to. But with Alexander, I felt an obligation to history. It’s bigger than me. My ego is nothing—look what Alexander achieved. And I felt he was a figure outside time, a figure we don’t even understand, because he’s frankly pre-Christian, and his concepts of honor go back to Homer. His concepts of patricide and matricide in the movie, the concept of conquest itself, the whole concept of going east to bring the world into unity… this can not be understood in post-Christian terms, because we’ve had so many wars. This was at the dawn of recorded history, and the Persian Empire was the only example they’d have had then of that kind of organization. It was a cruel empire with enormous amounts of slavery, no freedom, and a lot, a lot of corruption. When Alexander went east, he took as a model lessons he learned from Aristotle: the concepts of good governance. Despite all the criticism of Alexander—and he’s been hugely criticized and ridiculed, far more than our film—he’s lasted, and is recognized by those who really study him as a man who tried to do good, and an idealist who lived up to the myths. The myths of Achilles, the myths of Prometheus. A friend to man, is what I said in the movie. I know that people in the West were cynical about it, because of the George Bush experience and all the wars we fought. We really have to forget all that, to see Alexander in pre-Christian terms. AVC: Do you think it’s possible to draw lessons from Alexander and apply them to the modern age, given that we are no longer living in his era? OS: It’s a very tough question. We’re so far from that place, you know? But you don’t do films for that reason, for the lessons. For me, I did it because I read these stories as a child, the Mary Renault versions, so highly romanticized and beautiful, and I kept reading about Alexander over the years. I guess you could say he was a man who completely transported me and moved me and inspired me because of his idealism, and I’d go back to the Greeks, and I always liked Homer and all the philosophers and their way of thinking and their concept of honor. I think their concept of honor does apply to the modern age, and certain people that walk around are pre-Christian. Just because we live in a Christian era doesn’t mean we’re all Christian, necessarily. There is a sense of integrity in some people… and that can be Christian too, by the way. I’m not saying it’s an either/or, because Christianity did take a lot of Greek concepts. But concepts of integrity and heroism and honor are still important to the world today. Some people behave well, and some people behave badly. AVC: A lot of your films are about powerful people and how they wield power. What draws you to that subject in particular? OS: I also do films about a lot of underdogs, I hope you realize. [Laughs.] Whether it’s Natural Born Killers or Ron Kovic, I’m not only interested in power, per se. I’m interested, I suppose, in tortured power. [Laughs.] The tortured power of Richard Nixon and Alexander fascinate me. I can’t say the tortured power of George Bush, because [W.] is exactly the opposite. He’s not self-tortured, so I guess my thesis doesn’t hold up on that one. But W. interested me because he so affected our time, the 2000s, and I just felt we had to have some kind of dramatic interpretation of what happened. It was so shocking that this fella could become president. So that one doesn’t qualify as an Alexander-type movie, although at the time it came out, in 2008, if you remember, there were these hollow, superficial comparisons between him and Alexander, unfortunately because of Baghdad. And nothing could be further removed from the truth. With Alexander, you have to remember that when he went east, he never came back. [Laughs.] He stayed with the idea that he would integrate the East and West. He married three princesses. He asked his generals and his leading officers to intermarry. He wanted to stay in the East, and he let them govern themselves autonomously. There was tremendous peace in his wake, unless of course you betrayed the pact you made with him. But he honored his word and created a concept of civilization that fell apart at his death, although the four parts that were merged were well-ruled and had relative stability and peace, and that became the model of the Roman Empire. So his contributions to peace and prosperity were enormous. The trade that was created, and the language and the culture that was exchanged between peoples was the opposite of what happened with Bush and the Iraqi experience, where we looted and destroyed and we went away and we took the oil and we tried to reshape the world to the definition of American power. AVC: You’re one of the few directors with fairly wide name recognition. Is that a blessing or a curse, that people know who you are? OS: It’s nice in foreign countries. It’s rougher here in the States, but I think that’s part of the thing of being a native son. I think a lot of people misunderstand what I’m doing, because my films are not easy sometimes. They do deserve a second viewing. I think they get misunderstood easily. They tend to be topical, for example. Take the last three films; they’re all of the moment. World Trade Center was made five years after 9/11, W. covered only through 2004, but Bush was still in office, and the movie actually came out in 2008, only three years after the Iraq War started. Wall Street: Money Never Sleeps was about people who lived through that crisis of 2008. So all three were very current, actually, much more so than my past films. And I do think you pay a price for doing that, because people are still living in the moment, and they feel the passion of now. So they would say, “Why didn’t you attack Bush more?” Well, I’m trying to deal with a long-term event. I’m trying to see it through the perspective of time. I felt confident in all three cases that we could do a movie about the current affairs, but perhaps I was wrong. You get much more heat when you do something current. AVC: Do you think you’re too defined by your politics? OS: Oh, that’s another problem. Although as a dramatist, I don’t have politics. You go into this thing, and you may dislike someone like George Bush, but you make the movie from empathy. Same with Nixon, by the way. I do have a side as a citizen, and I’ve always expressed it, and that’s where I’ve gotten into misunderstandings, because some people see me as a leftist nut or whatever. A conspiracy nut. All that stuff. These are definitions that don’t really apply to a dramatist, because a dramatist is working from empathy. Scarface can be one form of it that I express, or I could be writing something like World Trade Center, which is from the point of view of a policeman. Every time you go into a movie, you go into the point of view of who it is about. If I’m doing W., I’m into the George Bush mentality. I’m not taking sides when I’m doing a drama. Nor, for that matter, are my documentaries. If you look at South Of The Border, I’m just letting the people talk for themselves, really. AVC: That film is very controversial, though, because it puts Venezuelan president Hugo Chávez in a positive light, which to some people is akin to glorifying a villain. OS: There’s a tremendous stake in denying the truth that these guys are saying in South America, that these women are saying in South America. You have to realize that you’re living in America, where we have, what do you call it… a “matrix.” [Laughs.] It’s a matrix as strong as anywhere else in the world, and probably stronger, because it’s strongly media-dominated, where you get an “official” version of South America, or of Alexander’s imperialism, etc. AVC: You also interviewed Fidel Castro for your documentary Comandante, which some found problematic. Do you feel like if you were making documentaries at any point in history that you’d be willing to talk to any world leader, no matter how dicey his reputation, and hear what he had to say, just as a neutral observer? OS: Oh man! I’d go to Alexander’s time first. Absolutely, I’d go through all history if I could. I’d love to. I am working on something, which is a culmination of a lifetime of this obsession… well, not obsession, more of a joy, a curiosity. I’ve been working on this Forgotten History Of The United States for three years now, and it’s going to air on Showtime. It’ll be 12 or 13 hours, in one-hour segments. It really starts with the atomic bomb in 1945. It’s left-of-center, but not radical, and it goes into the facts that have been forgotten, and tries to show the younger generation a pattern that has emerged that we are not getting from our media right now, nor are we getting in our history books at school. I’ve seen my kids’ work at school, and I think they’re better than when I was young, ’cause I was brainwashed into anti-Communism. This is a much more interesting view of history than I’ve ever seen, and I hope to God it works. It’s classic history, classically told. No talking heads. Just pure archival footage and a storyline. AVC: Does that have an airdate yet? AVC: Your visual style has evolved over time. Do you consider yourself still at this age a student of film? Do you study what other people are doing and try to apply it to your work, or do you try to forge your own path? OS: I do and I don’t. I see films in theaters, and I enjoy films. I enjoy the art of storytelling, and the different ways to tell them. I’ve changed my style constantly, so I’m not sure I have one defined style, except perhaps style of subject matter. But you learn as you go, I suppose. I’m more comfortable with simplicity as I get older. Before, it was more about layers of complexity, but Alexander is about as complex of a movie as I’ve ever made. That’s why it was challenging, the 2007 version, which is going to be showing at The Museum Of The Moving Image. If you have a chance to see that in a theater, that’s really… I hope it looks great. That’s the most complex film I’ve ever done, because we go back and forth like Nixon from time past, time present, time future, all tied to the storyline with Ptolemy and the library. The style fits the movie. But simplicity reigned in Wall Street: Money Never Sleeps. It was in straightforward chronological time, but complex for me because we had different storylines, different people, W. was again back-and-forth through time, and World Trade Center had dream scenes, but it was essentially a chronology of a 24-hour period. AVC: When people think of an “Oliver Stone style,” they mostly think of JFK and Natural Born Killers, but you’ve moved beyond that. OS: That docu-bang-bang-bang, yeah. I like that too, because to me, it fit the fractured mentality of the protagonists, and what I saw as the fractured mentality of the country at the time. I mean, it’s gotten worse. The media circus became insane back in the O.J. Simpson days, and it seems to have gotten worse. That style was really—Natural Born Killers was like, the most amount of cuts in any movie I’ve ever done. AVC: If you read reviews of your more recent films, some critics say they’re not very Oliver-Stone-like because they don’t have that frenetic style. OS: But even before Natural Born Killers, I was doing very classical-style movies like Heaven & Earth. That’s very classical, and so is Born On The Fourth Of July. Just pure chronology with different moods, different lighting, but essentially a simpler style of storytelling. AVC: Do you see yourself as part of a generation of filmmakers, the way the Scorsese/Spielberg “film-school brats” were a generation, or the way Quentin Tarantino and his peers are a generation? OS: I’d say I fall in the crack between, because I came on in the late ’70s, and Quentin came on in I guess the late ’80s, early ’90s. I feel like I am what I am. I don’t know what to say about that one. That’s perception, and if you repeat the perception enough, it becomes truth. I hope the work stands through time. See, right now I’ve been looking at old films, everywhere from 10 years old to 100 years old, and I’m enjoying them even more. For me, the beauty of it is that it lasts. It doesn’t have to be defined. I’d rather get past the tyranny of now, where you get judged for something based on what’s happening at the moment. On Wall Street: Money Never Sleeps, a lot of the judgment was harsh because it wasn’t a documentary like Inside Job, but it wasn’t supposed to be. It wasn’t about the crash in the way most people perceived it, but it was about those people on Wall Street. It was like what Welles did with The Magnificent Ambersons. You just do the log and record what people were doing at the time. You stick to the truth, and it’ll be perceived differently one day. Also, you have to look at that film as a bookend. One day if you look at Wall Street from 1987 and then you look at Wall Street 2 from 2010, you see two different worlds: two different Wall Streets, two different New Yorks. So there is this thing about time that you can’t see at the time you’re at. AVC: Home video has changed significantly from when you began making movies to now. Given that you think about posterity, how much do you think about the non-theatrical afterlife of a movie? OS: Home video saved Salvador, which was one of my first successful films. Nobody went to the theater to see it. Blu-ray, I’ve said, is the last physical hardware that will exist of films that you can collect and keep as your own private possession, like a book. From now on, we’re going to be logging onto some screen and renting a film, which is different than owning a physical copy. With Blu-ray, the quality is tremendous, and greater than even the old prints. It used to be that if you could get an old print and could show it in your home, it was a luxury. With Blu-ray, we’ve reached another level. People should really horde their Blu-rays like old comic books and baseball cards. [Laughs.] Because they’re really beautiful, and will be worth something if you like movies as I do. Do I think about home video? You can’t plan on it. If you make the movie from your heart and it stands over time, that’s what matters to me. I can see a movie and believe the story and characterization and stay proud of it. It doesn’t change. Even if it’s unappreciated, that doesn’t mean it can’t be appreciated in the future like an Alexander. AVC: Would you describe yourself as optimistic about the future of cinema? OS: Yes. I think there’s a whole older generation that will go to movies still. People like me; people over 45. It just doesn’t play to the younger demographic. Yeah, they do go to opening weekend, but the fact that Liam Neeson can make two consecutive movies in a row that are fun, easy to watch, and commercial says something. That’s a good night out. People will go to clean theaters; they don’t like to go to dirty theaters. That was the problem at one point, the maintenance was so poor that I think a lot of people lost interest. But now that there’s reserved seating, you can get a comfortable filmgoing experience, well-projected in digital, because in digital, you can maintain the quality. I think any filmmaker will tell you when they wandered from theater to theater to watch their prints, it was disheartening to see the poor levels of light and the disrespect for films that existed in certain theater chains. It was always inconsistent. And in the lab, too, the photochemical process was very difficult to watch, because sometimes they were shipping prints that you didn’t even know were two points off or three points off. We suffered greatly to make these films, and they’d be out-of-focus, with the sound too low. Now with digital, we have much better projection, and if the theaters are charging higher prices but providing refreshments and a clean, well-lit theater, there’s no reason why this cannot go on as a senior-citizen-driven business for years. Especially with movies for adults, like The King’s Speech or The Social Network—stories that are intelligent, not just heroic fantasies. Or I should say “comic-book fantasies.” With the word “heroic” I think Alexander, not Iron Man. AVC: Are you optimistic in general? Do you feel like we’re moving in a positive direction in the country, in the world? OS: I think everyone has the same question on their mind: Is the glass half-full or half-empty? We have enormous challenges in front of us. Every day that you get up, it’s some kind of victory if you’re making a good product, or working on a project that can only help mankind. We pray for no destruction, and for the forces of destruction not to take over. We’re all divided, but some of us have children, and we are invested in the future and would like to see good things happen. I feel like my answer’s ridiculous, but that’s all I can do. [Laughs.] I don’t have a mandate as a filmmaker to answer that.